Roeslein & Associates, Inc. is pleased to announce recent changes to its leadership group and the introduction of a new organizational structure. 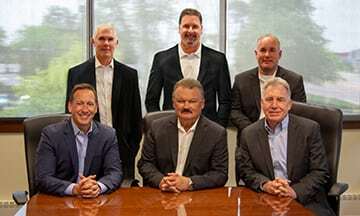 Roeslein’s goal in this reorganization is to provide clients, employees, and vendors with a seamless transition of leadership that places emphasis on business relationships built over the company’s 30-year history. Rudi Roeslein will continue to serve as CEO and will take on the additional title of Chairman of the Board, with Dave May transitioning to Vice Chairman of the Board. The two will focus on the company’s overall strategy and future planning, emphasizing sustainable growth and adding value for Roeslein’s employee-owners, clients, and society. “When you are engrossed in individual project details, it is difficult to step back and look at the big picture and to plan for the future. With Dave and I taking on these roles, we will have the dedicated energy to steer Roeslein in the right direction and be able to ensure the appropriate resources are allocated for future success,” said Rudi. Additional changes to the company’s organizational structure include the formation of three Divisions aimed to align company values and standards across its capabilities in Engineering, Procurement, Manufacturing, and Construction services. In order to achieve this, Larry Block, P.E. will serve as Divisional president of Professional Services, Rob Campbell as Divisional President of Manufacturing, and Charles J. Reneski, P.E. as Divisional President of Construction & Operational Services.